Last year at this time, I ran the Parks Half Marathon. I have slacked off a lot on my running this year (although over the past couple of months I've been coming back), so there was no way that I was even close to thinking about wondering if I could race a half marathon. The race goes close by my house though, so I dragged my family out first thing in the morning to cheer on the runners. The best though, the absolute best, happened when we were walking down to the race course. I was literally mid-sentence about how the kiddos should be careful walking along the side of the road because there were cars and...BAM. I stepped halfway off the edge of the walkway, my ankle caved, then my other knee collapsed and before I knew it, I was roll-sliding through the grass and mud by the side of the road on my face. I know I fell face first because that's where all my abrasions are, but I also know that I ended up on my back, because I felt the bag of pretzels I had in the backpack for my kids crushing, so I must have done some rolling too. I am sometimes not good at things. I really did appreciate the irony of the fall, what with the perfect timing of me being all, "Okay, guys, listen to me, we need to be careful walking there, because—AAAAAAAAIIIIIIIGGGGGGHHHH!!!!!" Also, if you remember when I ran the Parks Half Marathon last year, I fell twice. So obviously the only conclusion I can come to is that the Parks Half is trying to kill me in a hilariously ironic manner. I pretended I wasn't hurt and hobbled with my family down the side of the road to where we planned to stand and I unfurled my sign. 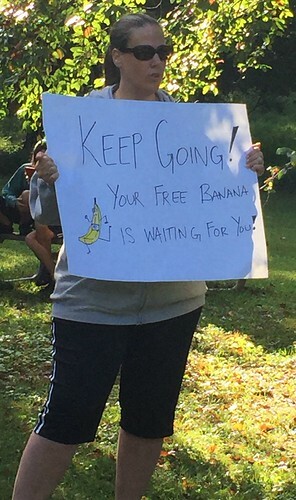 I had never brought a sign to a race before, especially a sign that was making an effort to be funny, so I was very worried about its reception. I was more animated that this photo lets on. I promise. 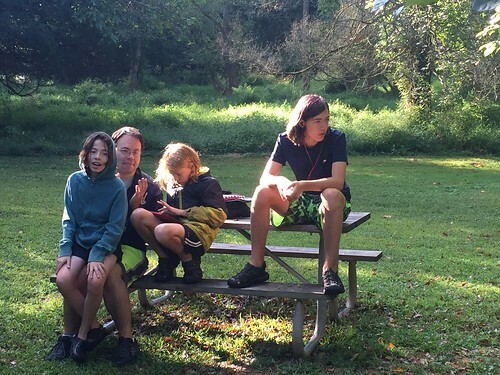 See, I was worried because my family of non-racers was all, "What if there aren't bananas at the finish line?" and I was all, "Dudes, it's a thing. It's almost irrelevant whether there are bananas there or not," but they just wouldn't let it go. Fortunately the runners were with me and I made a lot of them smile and laugh. My running banana helped with that, I think. Jack made people smile and laugh too. He spent a good chunk of time boogying down and singing, "I am a banana! I am a banana!" He was the only one of my kids who was willing to do any cheering. Alex wandered off to look at a bird. Happily, my mom is visiting and she was willing to stand near me and clap for the runners. Although I did have to shush her when she started saying, "Geez, my hands are going to be blistered from all this clapping," because someone running their tenth mile in a row probably isn't all that interested in hearing about your applause-related injury, Mom. My family bailed after about a half hour, but my mom and I stuck around until we couldn't see any more runners at all. I hope that all those runners are proud of themselves. I was so happy to be able to cheer them on. Maybe next year I'll be one of them again. At least if I run it next time, I won't be injured at a race I didn't even participate in. Or better yet, make your mom wear the banana suit. That way she wouldn't have to clap so much. I hope you heal quickly from your injury! I saw that sign and thought it was you - thank you for coming out. Didn't see any bananas at the end but I was distracted by the pizza. That race ran by my house too. Instead of hand drawing a sign and cheering for runners. I laid in bed and sent silent curses at the lone cheerer that I could hear. That banana suit is an EXCELLENT idea. You crack me up. You, ma'am, are cantankerous. Jean, so funny! I actually handed out bananas at last year's BCC Y Turkey Chase. It was fun; will volunteer again if Thanksgiving plans permit. Also, please take care of your ankles & knees. I'm just getting motivated to resume exercising again, and those are two areas that need strengthening, for me. I can TOTALLY relate - about a month ago I was running and tripped over an uneven piece of sidewalk and completely face planted. The entire left side of my face was black and blue and swollen for a week or two, I kept having to reassure people that my husband didn't do it, just my own klutziness! The bummer is that now I'm really nervous when I run, especially when I'm tired because my right foot seems to drag when I get tired. 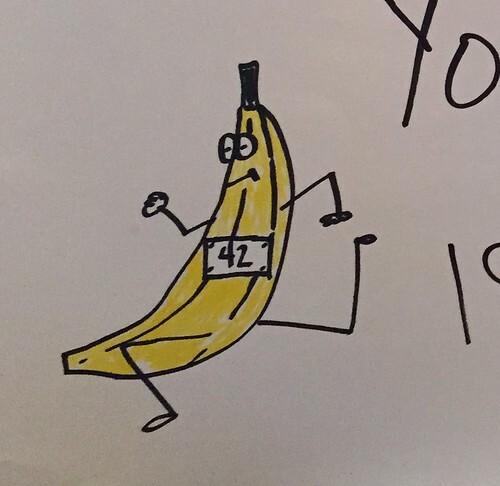 your running banana, and also your son the dancing banana, are both extremely awesome and made me laugh out loud. I rather appreciate the serious look with the hilarious sign. Oooooh, that's brutal. My feet drag when I'm tired too. But I fall all the time, whether I'm tired or not. Here's to both of us staying upright! Yeah, those joints have a hard job! I'm doing the Turkey Chase again this year. Hopefully I'll see you!